Note: If you're having problems find your way around the site, check out the Twitter stream for the The Whole Earth Catalogue. It includes links to various online editions. We've also added the text to our collection of Free eBooks. I can see that the time is ripe for a comeback! 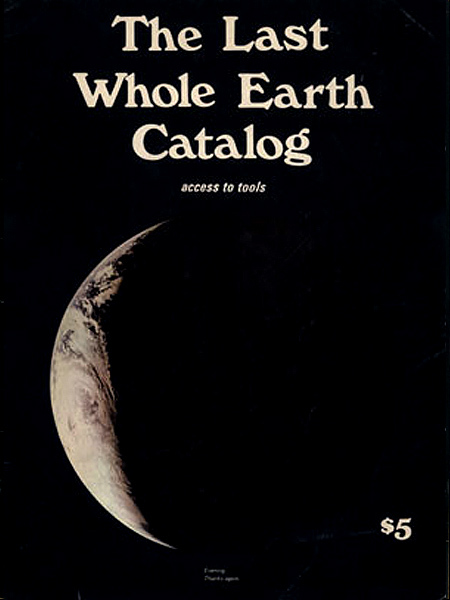 I had never seen the Whole Earth Catalog until a few years ago. A friend sent me Steve Jobs’ speech. I fell in love with that message. I even wear a “Stay hungry. Stay foolish.” T-shirt Thank you for keeping powerful thoughts like these circulating! I thought I posted a message ??? Okay, I’ve been amazed by the cultural force of The Whole Earth Catalog lately. A revolutionary publication (1968-1072) by Stewart Brand and others and which some have compared to the predecessor of the internet. And who do I find agreeing with me but Steve Jobs…This concept of providing tools for change (the publication was subtitled “acces to tools”) is part of the inspiration for my novel The Free Farm (Bottom Dog Press)…in which young people create a working commune in Southern Ohio. Brand and his wife Lois began in the most rudimentary way, by driving around the country going to campuses and welcoming communities with a truck load of such tools and books. We owe them a lot. When I wrote the novel, I felt Stewart and Lois should appear in it, and immediately got an endorsement from Stewart… “Go ahead, and use it.” He’s still making tools for us. 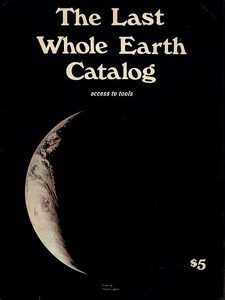 As a teenager, the Whole Earth Catalog seems to show what your own potential could be and prepare you for life’s challenges. we need a book like the catalogue but deals with design revolution and future solution; may be I should work on that. My catalog 1st took me to the Colorado mt’s. Living in a cabin for 5 yr. of bliss. And still liven the good life. I would like a catalog sent to me. I saw in an early whole earth catalog the destroylet was for sale. It was an outdoor toilet with a toilet seat and a fan under it! I want now to get a picture of it!